Published August 6, 2013 at 1814 × 2520 in Almost Home: The Sinking of the S.S. Caribou. Hi Jennifer.I heard your story on CBC Radio this morning,very interesting.My great grandfather was lost at sea in WW2 as well.My father worked on the new Caribou for years,until he passed away in 1996.It was so unfortunate for everyone on the Caribou that night in 1942,and your uncle was so close to retirement.I think your comic is a tremendous way to teach younger children about the history of that terrible event.Best wishes with everything.One thing I would like to point out however,about the hat your uncle is wearing on the photo.It was most likely not a Captains hat,but your uncles own hat belonging to his formal ships officer uniform.Engineers are ships officers and a hat goes with their uniforms as well.I still have my fathers hat,he was a Purser.Good luck with you comic,again it’s a great way to teach important history to a younger generation.Thank you. Thanks for commenting Alex. Yes, there were a lot of Newfoundlanders who were involved in the Battle of the North Atlantic, and many lost their lives. As for the hat, I’m very interested in what colour your father’s cap was. 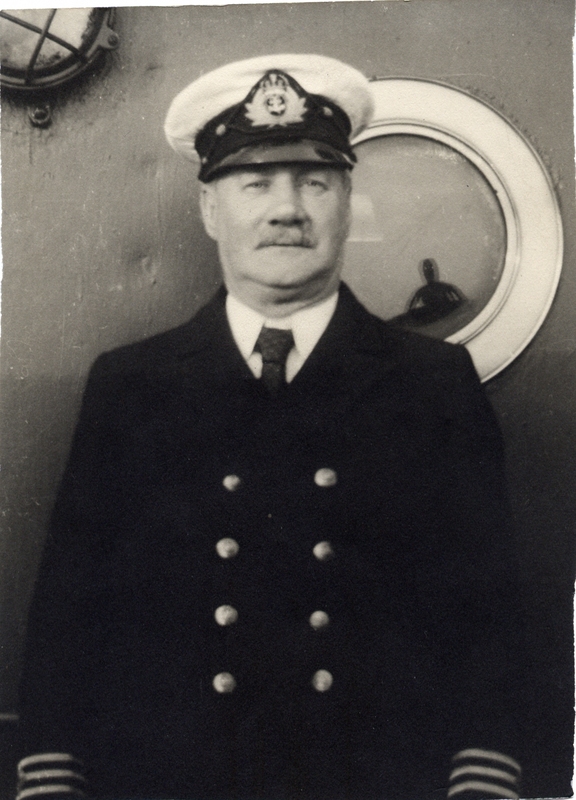 As an officer, Thomas Moyst would have had a cap, but the sample at the Railway Coastal Museum is black, and the other photograph I have, he is wearing a black cap, with a brim and the insignia on it. But the two mates in the other photo have a white cap, which isn’t in the RCM, but is the colour of the cap Thomas Moyst is wearing in his photo. In my comic I’ve drawn him in a black officer’s cap. But I am still trying to find out if that’s the right colour or not. Maybe I’m wrong. Thanks Alex, since getting your note I’ve been talking to a lot of people here on the west coast, and they tell me that there was a white cap that the officer’s pulled up over their black caps in the summer.